The writing of Behind The Smile was not achieved quickly. In fact, it took six years, but the research was even more protracted. That took Mr. Jones 45 years. ‘Behind The Smile’ will be seen by many as relating only to Thailand, but that is not the case, he maintains. Mr. Jones was born in Barry, South Wales, but did not saw the rough side of town, although many would have though that where he came from, the Colcot (‘working side’, as the taxi drivers called it} was pretty bad. His parents gave him and his four brothers a good life, but really, he says, he should only speak for himself and will do so from here on. Mr. Jones says that his type of brain made learning and passing exams quite easy. He had also been brought up to be polite, so, except for a resistance to authority, he got on well at school. He recalls that he never had time to see what was later described to him as the ‘seamier side’ of life. One evening, after school, when he was about 17 years old, he went with the school rugby team to a couple of bars in town, his first pub crawl. It was St. David’s Day and they sang at least one song in each bar in that pre-jukebox era. He say: “We sang all night, which in those days was until 10:30 and I was introduced to some appreciative ladies – young and not so young – who were described as ‘working girls’. “I knew the expression, of course,” he says, “but it was the first time, I had ever met any. They did not seem as, as …., ‘bad’ (I suppose) as I had been led to believe by jokes, the TV and general gossip. In fact, I was quite fascinated by them. A few years later Owen moved to Portsmouth, which in the Seventies had 20,000 sailors and 20,000 students, but was / is actually a garrison town. In those days, most of that number would have been men but, he says that there were plenty of women about too. However, being ‘still a swot, well, a little bit less so by then’, he did not get involved until he took a part-time job in the Wiltshire Lamb near the Students’ Union. The landlord’s name was ‘Sweeney’ Todd. He had just retired as a Master at Arms after a lifetime in the Royal Navy. Owen says that he earned and learned more after shifts that he should have. There were many working girls in the Lamb, especially after hours. 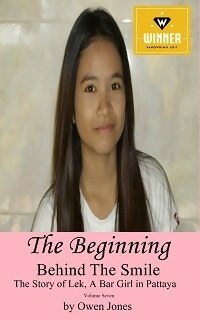 For more information about the ‘Behind The Smile’ trilogy, please go to http://behind-the-smile.org or read the pages below this one.